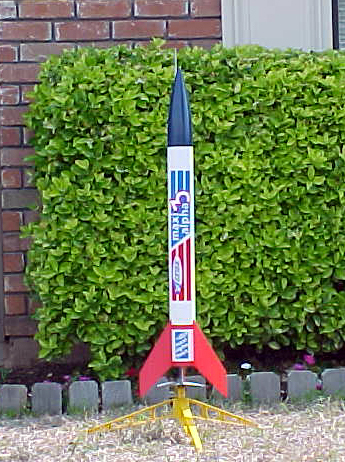 We have been building and launching model rockets since June 1997. During this period, we have accumulated several rockets and logged in over 375 flights. 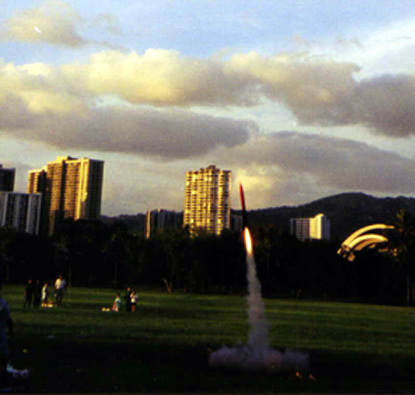 We are members of the Sky Performance Rocketry Club of Hawaii (SPRCH) and the National Association of Rocketry (NAR). 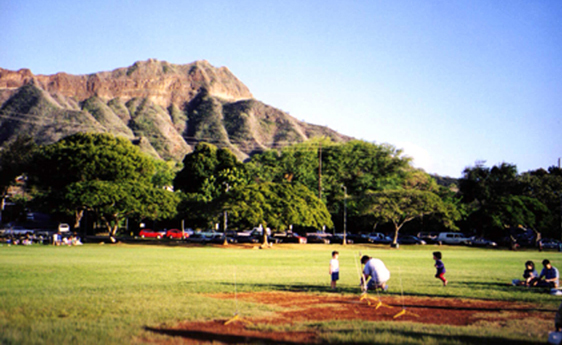 Our first rockets were flown at Kapiolani Park in Waikiki, Hawaii. It is a large park made up of several soccer and softball fields. There is a lot of wind blowing off the ocean making it difficult at times to recover even small rockets. The largest rocket that we saw flown at this park was on a G engine. We recently moved to northwest Louisiana and are looking for places and other rocketeers to fly with. Along the way, I have learned many things about model rockets. Most of the knowledge I've gained came from one of three places: other model rocketeers, model rocketry books/magazines, and my own experiences. I have learned the most from the people I have met since starting in the hobby (both in person and on line). I highly recommend trying to find a club near you to fly rockets with. There is a wealth of knowledge to be gained by flying rockets with others, not to mention the friendships and getting to see what others in the hobby are doing. Here are some of the things I have learned about the building, painting, and flying of model rockets so far. I keep a detailed journal of every rocket that we build and fly. I am tracking every change made to our rockets and how they fly with different engines and weather conditions. This allows me to make informed decisions for the next flight. It doesn't always work, but it's a good place to start. I also measure the parts of the rocket (body tube diameter/length, etc.) and trace the fins onto the back of that rocket's journal page before I put it together. These measurements are used to make spare parts when the original part(s) break, wear out, or the rocket gets lost and I want to make another one just like it. Every winter I inspect my rockets and equipment to make sure everything is O.K. If something is in need of repair or needs to be replaced this is a good time to do it. I recently purchased an Estes Scissor-Wing Transport. I built one like it about 20 years ago. This is the rocket that got me interested in model rocketry. The first one glided off into infinity. In case you are not familiar with the Scissor-Wing Transport, here is a picture of what it looks like. Soon after we started buying and building rockets, they began to take up a lot of room. We needed a place big enough for three people to build, repair, and store several model rockets, launch pads, and accessories. The most logical place was the spare bedroom. We decided to convert it into a hobby room for the three of us to use. We have two tables set up for building and repairing rockets. Click here to see view one or here to see view two of The Rocket Room. These pictures are from our house in Hawaii. I will be posting new ones as soon as I get the chance. These are some pictures of some of the things I have been working on lately. Our Last Launches In Hawaii Our model rocket club in Hawaii (SPRCH) conducted a demonstration launch during Waiokeola Preschool's kite day on March 5, 1999. Here are some of the details of the day's events. For a picture of several of the rockets we flew that day click here. We even got a little coverage on the local television station's 6 o'clock news. Along with some footage of the kids flying their kites, the launch of my Estes Shadow was lucky enough to be included. 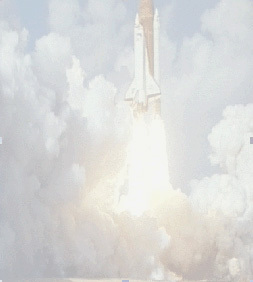 Our last launch in Hawaii also included several firsts for us. These are the April 4, 1999, results. We flew my Shadow on an Aerotech E before we left Hawaii. It was more exciting than I would have ever imagined. Here are some pictures of the flight: The Shadow on the launch pad and at liftoff. The Shadow coming back under full chute. What's New 1. While looking through some old pictures I took while in Hawaii, I came across a picture of a cool looking missile. 2. October 7 - Due to the number of e-mails I have received lately on the subject, I will soon be adding a short section to this page on a few ideas for Science Fair Projects. 3. October 7 - I just added a buzzer to one of my Estes launch controllers. I have static tested it and it sounds cool. Pictures and directions coming soon. 4. October 8 - Updated the journal page to include the last nine rockets I've added to my fleet. I will be adding additional information to all my journal pages as time permits. I want the journal to be more than just: I flew this rocket this day and this is what happened. I want to add some personal information about each rocket and, in some cases, maybe a small picture to make the pages better. 5. Jan 13 - We launched 5 rockets today. 6. Mar 12 - Updated the Science Fair page. 7. NEW LINK - Glow Inc, Glow in the dark paints and powders that make your rockets more visible. 8. I am in the process of making another page for one of my other hobbies which is hunting for arrowheads. All of the Indian relics on this page were found legally on farm land near my home. Pictures of Some of My Favorite Rockets in Flight NOTE: There are a series of three pictures in the following two links. It may take a while for them to load on your computer.